Our Playground Consultant, Donella Felton, worked closely with St Margaret's CofE Primary School to create two active play zones with the addition of some exciting playground equipment. 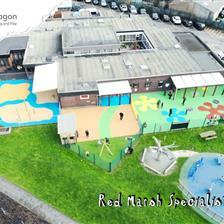 The school wanted a designated area for physical play for both their Key stage 1 and Key Stage 2 children. Children's continual development was important to the school, so we ensured that the climbing challenges on offer in the Key Stage 2 environment were similar to those in the Key Stage 1 area but with a higher level of difficulty. This ensures that the children currently in KS1 will develop climbing confidence and the skills needed to tackle the more challenging playground equipment installed in the KS2 environment. Focusing on the Key Stage 1 playground, it was important to try and cover as many developmental areas as possible with introductory climbing equipment which would challenge the children without putting them off from participating. We installed our Walk and Stretch to focus on the children’s foot placement and foot-eye coordination. When the children become comfortable using this piece of equipment they may stop using the posts as hand holds and walk along without any assistance. Our Cheviot Log Climber is the focal point of the environment. This is a fantastic non-prescriptive resource that will help develop children's upper and lower body strength, core stability and fine motor skills. While overcoming our Cheviot Climber, the children will begin to understand how to use their upper and lower body to stay balanced and stable while climbing over logs at different heights. 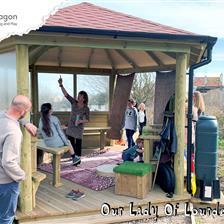 There is also plenty of space underneath for den-making and outdoor reading. We also added our Tightrope Bridge to develop lower body strength and balance. Eventually, children will be able to cross the bridge without the assistance of the handrails. The skills the children learn and gain from playing physically with these resources will help prepare them for the active equipment chosen installed in the Key Stage 2 playground. 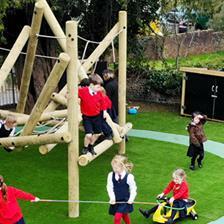 The Active Play Zone for Key Stage 2 includes our much larger Skiddaw Log Climber to further test and develop children's strength, agility and climbing abilities. To continue to further develop children's foot placement and grip and grasp, we installed Climbing Poles for children to manoeuvre through. Twist Net – A connecting challenge that improves physical coordination, lower body and core strength. Monkey Bars – An overhead crossing challenge that test children’s upper body strength whilst teaching them about the importance of momentum. Pull Up Bars - A great upper body physical strength challenge. If you are interested in any of the products installed here at St Margaret’s or would like to discuss how we could help develop your outdoor space, make sure to Contact Us through our Online Form or call us on 01625 890 330 (Northern Office) or 0117 379 0899 (Southern Office).